You are currently browsing the CrackedActor.com – a David Bowie fan site weblog archives for November, 2008. Yeah, what chick doesn’t have a girl-crush on Iman? Apparently this item was important enough to make not one, but two news articles. I think it’s hilarious that the Digital Spy article says Dawson “revealed” to them that she’s got a crush on Iman, like it’s some huge secret she told them in confidence. Must have been a slow day and the bosses felt the item needed a bit of jazzing up. After a long illness, Guy Peellaert has passed away. He was 74. 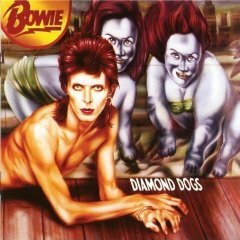 Peellaert is best known for designing the covers for Diamond Dogs and The Rolling Stones’ It’s Only Rock ‘n’ Roll. Read more about Peellaert at the L.A. Times and GuyPeellaert.com. Last week David Bowie and Iman attended the annual Keep A Child Alive Black Ball. Nothing really earth-shattering happened for me to report on, but I do want to direct you to the blurb written in The Sun. The picture accompanying the article is really great. Too bad The Sun is territorial about their photos, otherwise I would put it in the gallery. I’m a lazy twit. Here is the link to the Wire Image photo set from which the photo in The Sun came. And here’s some more eye candy as well. That explains the pop-up window in response to a right-click on the picture in the article. I’ve been playing with the plug-ins for this site for the past hour and have added a few things. Most importantly, there is a new system of user registration. New users can set their own password, have a couple more fields they can fill out, and must complete a captcha. My time is better spent doing fun stuff with this site than sorting through spam users. Additionally, users can now subscribe to comment replies and add photos to their accounts. Have fun! The Looking At Music exhibition at MoMA will examine the influence of technology on experimentation in music. Music videos from the early days of The Beatles, David Bowie, Captain Beefheart, The Residents, and Devo will be featured to demonstrate changes in tehcnology and music since 1965. Starting on December 1. 2008 Thurston Moore of Sonic Youth will host Early Music Videos by David Bowie. All of the videos that will be featured are part of the gift from the David Bowie Archive to MoMa earlier this year. The show runs through January 5, 2009. So if you’re in the Denver area from now until November 9, be sure to check it out. Sounds interesting. The Rise of David Bowie and the Supergroup From Hell? You know and I know that this is likely a bunch of crap, but I feel obligated to tell you anyway. After all, who is not in need of a good laugh on a Monday? No one. So I bring you, the latest laughable gossip featuring the popular gossip trifecta of David Bowie, Mick Jagger, and Elton John. Ready? Okay…News of the World reports that the three men are working on forming a supergroup to play the London 2012 Olympics. Cause, um, unnamed sources talking to tabloid magazines are always the most reliable source of information.